As a fellow SFU student, I have definitely had my fair share of anxiety and my moments of panic. And while mine are sometimes only limited to feelings of pressure from deadlines and exams, these experiences are especially frequent and unavoidable for those who suffer from clinical anxiety or depression. Mental illness is not a topic that is often brought up, but in Tea Time with Anxiety, director and lead actress MaFer Douglas aims to shine a light on how it influences our personal relationships and everyday lives. Tea Time follows the story of Serena, an aspiring visual artist and tea enthusiast, who is soon to be married to her fiancée Lucas, a casual knitter with a taste for cereal. Right away, Douglas establishes their defining traits and the dynamic of their relationship. Serena spends the majority of her time working on her paintings for an upcoming exhibition. At the same time, she remains anxious throughout the entirety of the play, using tea as a way to avoid confronting her worries on her art show and upcoming marriage. Lucas, on the other hand, is the complete opposite. He has a bubbly and cheerful outlook on life, frequently offering positive reminders and maintaining the role of a supportive partner. From the start, it is made clear that Serena suffers from an anxiety disorder, and Douglas gives a stunning performance that allows us to understand this perspective. 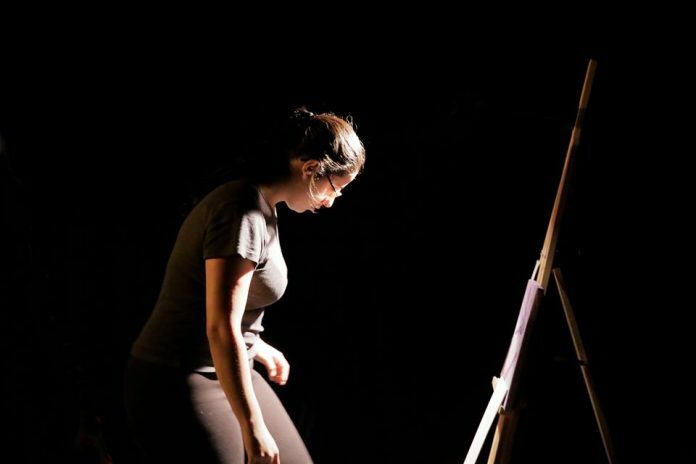 Her portrayal of a struggling artist suffering from mental illness felt life-like, garnering empathy from her audience as it felt straight from the heart. The use of sound and lighting further captured Serena’s conflicted thoughts and heightened the extremities of her illness. Flickering lights alongside muffled voices cued instances in which Serena feels trapped in her inner voices, and the audience themselves are able to capture this emotional state too. Douglas then recalled a conversation with Lucas’ actor, Aman Mann, and asked him what he would have done had he been in that situation, and he said that he would have found it difficult to stay. And surprisingly? Douglas agreed. Tea Time is a thought-provoking depiction of mental illness, and how it affects individuals and their loved ones. It urges its audience to reflect on their own actions towards people they know who suffer from similar afflictions. The play embraces the powerful message of hope and love, because while it is far easier to walk away, maybe most of us will choose to stay. Although director Douglas and producer Xongos Arts Club haven’t announced any future performances, Douglas hopes to perform Tea Time with Anxiety in the near future again to shine a light on mental health awareness.